I have an itty, bitty secret, that relates to my parenting, and I may not be very proud of. My little girl that just turned three this past October 29 is still on that pacifier. There! I said it! I don’t know why I feel the need to be ashamed and embarrassed to admit it. Is it because some moms look at it to be evil? Will I look like a bad mother because I’m allowing my toddler to soothe herself? Am I really ruining my daughters teeth? I thought Potty-Training was going to be a lot tougher, boy was I wrong. 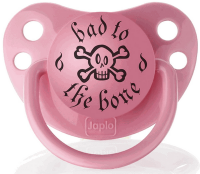 Nicking the Paci has proven to be the most difficult challenge to date for me in my parenting journey. Okay, let’s be clear. She doesn’t walk around with a pacifier in her mouth (that I find to be a tad disturbing). She knows she’s a big girl and will only use her pacifier to sleep. I remove it as soon as she falls asleep. I have tried everything: books, movies, putting in an envelope to be sent to a baby who needs it, Binky Fairy took it disappearing act… nothing worked. What we were left with was a toddler that did not want to sleep. No matter how tired she was. Mix that with her tendency to get terrible night terrors if her sleep schedule is wacky and you’ve got long, sleep less nights… for all of us! I’ve spoken with my dentist and pediatrician and have read up on many articles concerning this very touchy subject and am fully aware of the good, the bad and the ugly of pacifier usage. 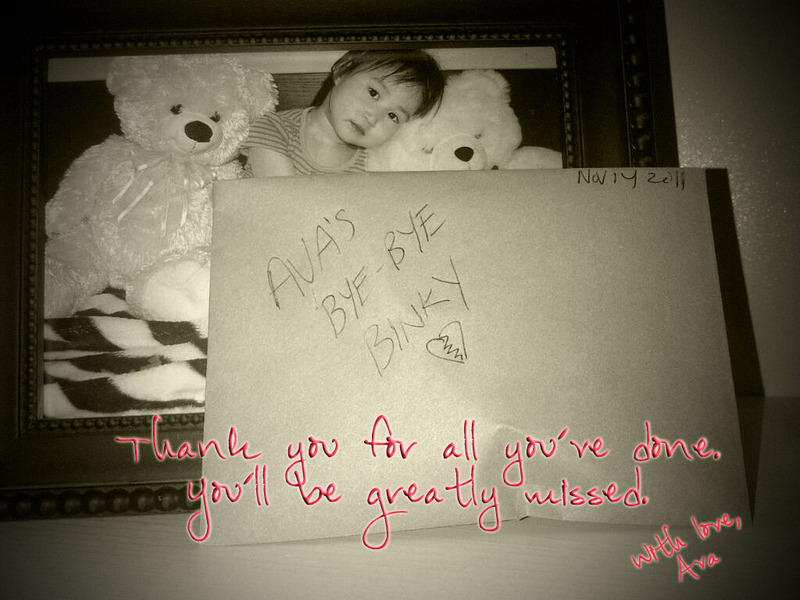 Ava is extremely intelligent for her age (and trust me, I’m not just saying it because she’s my daughter). She learns and picks up things so quickly and her communication/speech is more than perfect! In fact, she started speaking very well shortly after her 24 month birthday. So am I concerned about poor speech development? Not at all. Recently, I received this wonderful book from the Pacifier B Gone System, which is also a PTPA winner, called Now I’m Big: It’s Time for The Binky Fairy to Visit. This book was soo good in fact that we were very close to shipping “Sucky” away to Binky Land with Binky Fairy. She really wanted to give it away to a little baby that needed it. The envelope was sealed and signed and everything. Well, lasted a few hours. Bedtime came along and along with her security blanket (another thing attached to her hip), she wanted her sucky. Here’s another thing I will admit. I was a thumb-sucker. I sucked my thumb from fetus to 6 years old! Do I have bad teeth or an over or under bite now? No. In fact, I have never had any braces and my teeth are perfectly aligned. I’ve also never had any major tooth issues to this day aside from a few cavities/fillings growing up as a child. So really, should I be so hard on myself and feel the need to have to always defend the fact that my daughter still uses her “sucky” (as she calls it) to fall asleep at night? We are working, everyday, to say buh-bye to binky. No pressure on our little one. She’s a big girl now and she constantly reminds me of that. It won’t be long till she realizes that big girls don’t need pacifier’s. Am I Having a Girl or a Boy? Fun Ways to Tell! As a parent you do the best that you can for you and your family. Oh the pressure we put on ourselves to be a certain kind of parent! I can relate! My daughter had horrible night terrors too, I’d have done anything for a good night sleep. She pacified herself by sucking on a stuffy until it was nothing but shreads LOL You are indeed a fabulous mom! Thanks so much for the words of affirmation! 🙂 We tend to be so hard on ourselves, don’t we? What matters is the health and happiness (and good nights sleep!) of our children (and us!). My son used his (only at night) until 4. I let him give it up when he was ready and exchange it for a toy. I’m glad we had it as before he turned four he had a major medical emergency and it was a real help soothe him while in the hospital. I’m so tired of people being so judgemental of choices. If it’s not a soother, it’s the bottle or formula feeding. I went with what worked for our family. Great post! I think we, as parents, need to stop being so judgemental of each other! Either of my children would take the pacifier,but I have seen what a job it can be to take it away. Getting rid of my son’s paci was so hard. He was almost 2.5 yrs when he gave it up. He’d bitten through it and I told him we didn’t have any more. He cried a bit the first night and then has never talked about it again. BUT it was the THIRD time we’d tried to break him of the paci habit. So, I kinda think they’ll let it go when they’re ready…gulp. Thanks, Karla. I’ve also learned not to feel bad. 🙂 And I’m pretty sure we’re not the only ones.